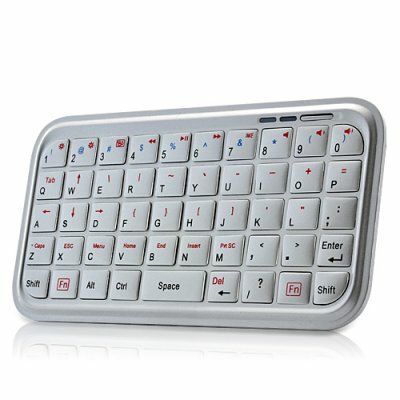 Successfully Added Mini Bluetooth Keyboard for Android, iPhone, iPad, iPad 2, PS3, More (Silver) to your Shopping Cart. Mini Bluetooth Keyboard - the perfect companion for your Android, iPhone, iPad, iPad 2, PS3 that makes typing, chatting, and gaming easier than ever. Use this Mini Bluetooth Keyboard with your computer or Smartphone to enjoy responsive keys, featherlight typing, portability, and Bluetooth functionality everywhere you go. The sleek and slim design fits comfortably in your hand and allows for easy typing with its 49 keys, including a full QWERTY keyboard and complete with a space bar and number keys. This Mini Bluetooth Keyboard even includes a FN (function) key used for accessing arrow keys, right click, and a home button, making web browsing on your phone easier than ever. With its Bluetooth 2.0 compatibility, this Mini Bluetooth Keyboard works with most Smartphone operating systems, including Nokia Symbian (S60+), Android and Windows Mobile (6.0+). Setup is quick and easy and in mere seconds your Smartphone will be equipped with the ideal tool for texting, writing emails, chatting, web browsing, and even gaming. For those who need more options, this Mini Bluetooth Keyboard even works with an iPad, PS3, and Bluetooth-enabled laptop/personal computer! This useful Mini Bluetooth Keyboard turns typing and texting on your mobile phone into a whole new experience. Available in our warehouse now, order today and we'll express ship it out tomorrow. Brought to you by the leader in China Electronics - Chinavasion. Pocket sized, sleek & slim design. Ideal for typing emails and chatting, and gaming. 49 key QWERTY keyboard layout. Can you provide a different, or even custom, keypad format? Not at the moment, but for those planning on making bulk orders, please contact our customer support team. Will this Mini Bluetooth Keyboard work with my _____ phone? Check the "Systems Supported" section under Manufacturer Specifications!